ELCA Churchwide Lutheran WebRing open to ELCA Lutheran congregations, affiliated Lutheran organizations, as well as ELCA Lutheran church clergy, and members with personal websites containing Lutheran content. Discussion of issues relevant to the Evangelical Lutheran Church in America. Participation by members other denominations in ecumenical dialogue, and other Lutheran and non-Lutheran interested parties welcomed. Includes Worship schedule, program and events calendar, location, contacts and links for both parish churches: Redeemer Lutheran Church (ELCIC) and New Stockholm Lutheran Church (ELCIC). Traces Lutheranisms story from the beginning, with the American migration detailed, especially concerning The Lutheran Church -- Missouri Synod. Church and nursery school. Includes calendar and links to Lutheran/Christian history, art and music. A Congregation of The Evangelical Lutheran Church In America. Provides services, staff and ministry programs. A Lutheran church belonging to the American Association of Lutheran Churches (TAALC). Includes Worship times, location, activities and groups, contacts, and dial-a-devotion. Lutheran Church-Missouri Synod. 12 Guardian Lutheran Church Jacksonville, Florida. Member congregation of the Lutheran Church--Missouri Synod. Contains beliefs, a worship schedule, sermons, announcements, newsletter, photographs and resource links. WELS. Shares a pastor and a web site with Our Redeemer Lutheran Church in Wabasha, Minnesota. Mission statement, beliefs, communion practice, contact information, and worship schedule. WELS. Shares a pastor and a web site with Grace Lutheran Church in Nelson, Wisconsin. Mission statement, beliefs, communion practice, contact information, and worship schedule. Shares a pastor and a web site with Grace Lutheran Church in Nelson, Wisconsin. Mission statement, beliefs, communion practice, contact information, and worship schedule. Shares a pastor and a web site with Our Redeemer Lutheran Church in Wabasha, Minnesota. Mission statement, beliefs, communion practice, contact information, and worship schedule. 21 Trinity Evangelical Lutheran Church, Smiths Mill, Minnesota (WELS) Near Janesville. Gowanstown and Kurtzville area includes list of all Lutheran Church Canada congregations, service times, history and events. ELCA. First Lutheran Church in Karlstad, and Eidvold Lutheran Church in Halma. News items, worship times, events calendar, pastors monthly column. First Lutheran Church and Eidvold Lutheran Church. News items, worship times, events calendar, pastors monthly column. An ecumenical Lutheran E-zine promoting Lutheran unity of purpose and Lutheran piety of the Common Ground Fellowship. For anyone with a genealogical interest in the Lutheran church in Texas from pre-Republic times to the mid-1950s. 29 Prince of Peace Lutheran Church Huntsville, Alabama. Location, service times, contact information, and mission statement, as well as Lutheran related links. Cooperative venture by members of the Evangelical Lutheran Church of England touching on matters theological and practical. If the business hours of Good Shepherd Lutheran Church, Plymouth, Wisconsin (WELS) in may vary on holidays like Valentine’s Day, Washington’s Birthday, St. Patrick’s Day, Easter, Easter eve and Mother’s day. We display standard opening hours and price ranges in our profile site. We recommend to check out goodshepherdplymouth.com/ for further information. 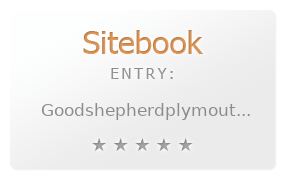 You can also search for Alternatives for goodshepherdplymouth.com/ on our Review Site Sitebook.org All trademarks are the property of their respective owners. If we should delete this entry, please send us a short E-Mail.